Giving a slightly different figure in an article based on the study in an online portal, the economists say, “The urban population share has been rising steadily over time in India, from 17 per cent in 1950 to 31 per cent today”. 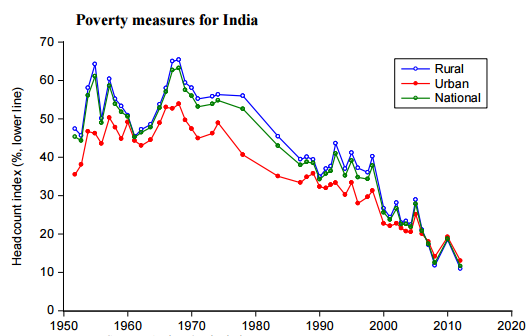 Titled “Growth, Urbanization and Poverty Reduction in India”, the study has been authored by Gaurav Datt (Associate Professor, Department of Economics and Deputy Director, Centre for Development Economics and Sustainability, Monash University), Martin Ravallion (Edmond D. Villani Chair of Economics, Georgetown University) and Rinku Murgai (Lead Economist, World Bank). Ironical though it may seem, the economists – taking an approach similar to top World Bank policy makers – observe a “notable change”. 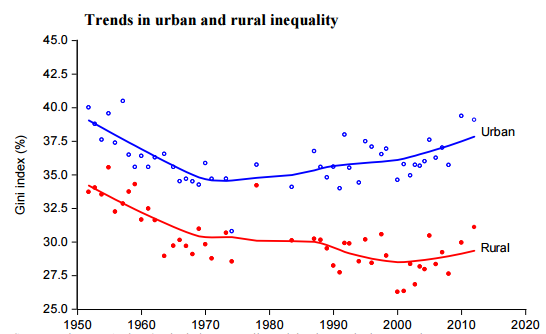 They believe, urbanization process, albeit slow, was instrumental in reducing overall poverty (rural plus urban) in the country. “Seen through the lens of growth by output sectors, the contribution of primary sector growth has rapidly dwindled from accounting for about two-fifths of the total poverty decline pre-91 to less than 10 percent of the total (and larger) poverty decline post-91”, the economists say. “The tertiary sector alone has contributed over 60% of the post-91 poverty reduction. The secondary sector growth has contributed about a quarter. India’s construction boom since 2000 has clearly helped assure a more pro-poor growth process from the secondary sector”, they add.